Faith Vessels is pleased that a variety of denominations throughout the United States are using artistic pottery we have custom made for their church worship services. Below you'll find comments and photos they have shared with us. "The bowl arrived safe and sound. Thank you. It is beautiful and will be used next Holy Thursday for our Mandatum ceremony in the convent, which is a time when the Superior of the community washes and kisses the feet of each of her sisters. Thank you again!" 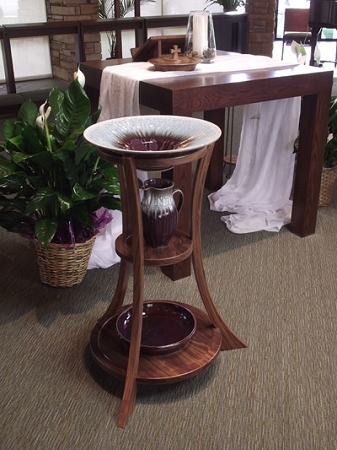 St. Martin in the Field Episcopal Church in Aurora, Colorado purchased a Good Shepherd stand in natural cherry with the font, pitcher, Ash Wednesday bowl and foot washing bowl in Eggplant/Blue glazes. "Everything got here in perfect shape. Thank you for both your talent and your calling. You two are quite a team. Again, thank you for the Baptismal Font, the set is beautiful." 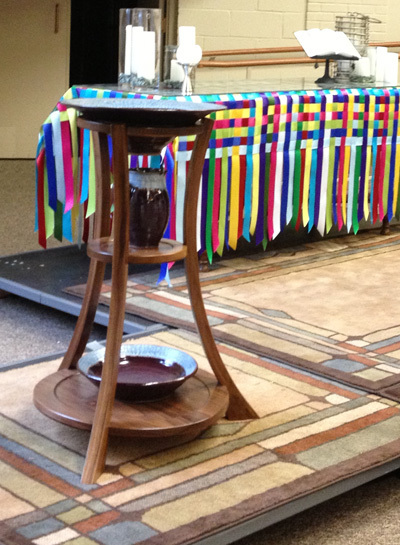 King's Way United Methodist Church in Springfield, Missouri, purchased an Eternal Waters stand in walnut with our Eggplant/Blue glazed font, pitcher and foot washing bowl. The colors perfectly complement the woods and architectural design of their chapel. 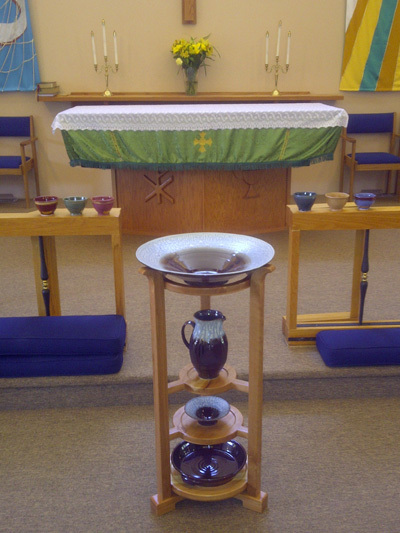 "This Eternal Waters set was a gift from my church for my ordination in 2012. It took my breath away and continually blesses my congregation and me when we share it in special acts of worship. The simple beauty of each vessel reminds us how it is into the ordinary that God breathes to give us the sacred." 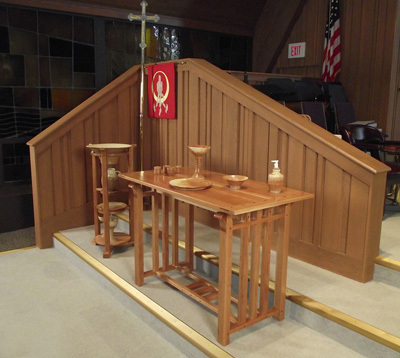 Blue Ridge Boulevard United Methodist Church in Kansas City, Missouri, commissioned us to custom design and create a communion table to match our contemporary Good Shepherd baptismal font stand. Both pieces were completed in natural cherry wood. The church pottery is glazed in Nutmeg/Ivory. We created hand sanitizer pumps for communion services at their request. 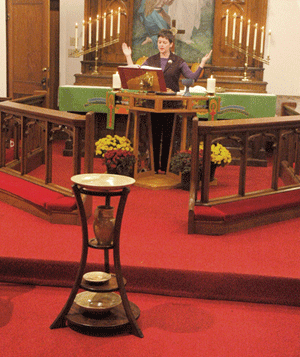 "The congregation has been very complimentary about the font and communion sets. Everyone says the woodwork is so beautiful, too. Thanks again! We are so very pleased. We look forward to working with you in the future with the baptism bowls." "The font and stand arrived in perfect condition! I am sending along some photos of our contemporary worship space in our fellowship hall you can see it in its new home. It is just beautiful and everyone loves it!" "Thank you for doing such beautiful work. We are thrilled with having chosen your design and it was a pleasure to work with you. Thanks be to God for the way you are using your talents to fulfill the Great Commission!" "The foot washing bowl you made was used this past Saturday in our program entitled "Journey To The Cross." There are eight different multi-sensory stops that participants walk through, and this one was the Foot Washing stop. Your bowl worked wonderfully and added a sense of authenticity to the Journey. Thanks again for the work you do!" "We were so excited to receive our Baptismal Font Set from you and quickly opened the packages when they arrived. The beauty of the pottery and craftsmanship of the stand were above our expectations! We can tell each piece is crafted with love and devotion as if doing it unto our Lord. God Bless you and keep up the good work!" "The communion set arrived today, and it's wonderful! Thank you so much; we will dedicate them in worship Sunday and use them that day as well. You two are doing a fantastic ministry!"